hi, noted, need to test, is there any user feedback? I could add this into mesh extra tools, let me know. Mesh extra tools? OK, please add it. hi, tested & it seems ok, not really suited to mesh extra tools. looks like the only possible way is to merge with f2 addon & offer bool in addons preferences to choose the method the user requires. Some hint that: in Booltools we have a checkbox in addons preferences to choose between boolean solvers. I think this is only & most appropriate way to get this committed. @Duyun Ivan (DIV) people are used to f2 & it's behavior, I see changing the defaults in your addon can emulate f2 in many ways, but there's corner cases your addon may fail with. That aside for now, what I would like to see is a checkbox in your panel to use standard F2 addon or to use your new functionality, with the default being the current f2 addon. I would also clean up the ui a little. I find the addon is useful & provides new methods for face creation, if your happy to make the requested changes, I can make the update & accept the addon. just to follow up quickly, SmartF uses F key, so does F2 addon, In my tests the addons worked different & I found where 1 fails the other may succeed. as they play well together, they could be merged to have the best of both worlds, an alternative to this would be another key other than "F". I think a merge to extend the functions of F2 with SmartF would be the best answer. 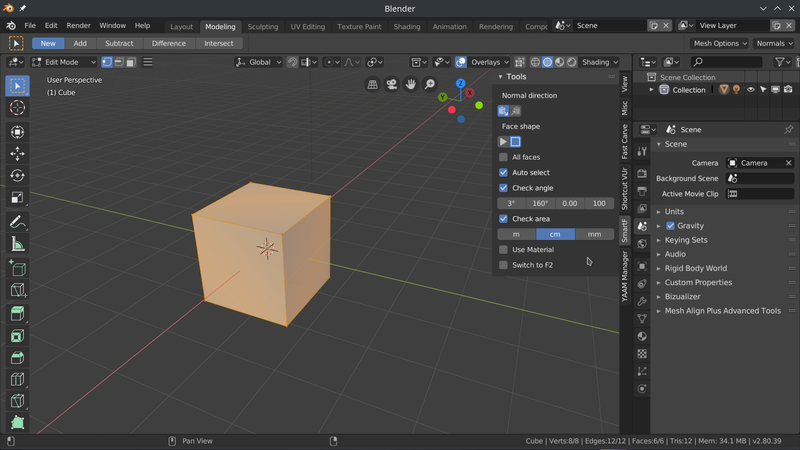 And F key - it`s not F2 key, it`s Blender default key for makeing face and edge. Only this reason is for using F-key in SmartF. And no matter what F2 use or some another addon(if they use F), because you can not use it in same time. I've tested the addon a couple of times & it's very good, I'm just trying to help sort out a couple of issues so we can add to blender. hotkeys should not be same as other addons, so I'm trying to solve that by saying merge in f2 addon into yours. In my tests your method of quad face creation removed a click & was very nice. however, it did create some doubles & fail changing face order & direction sometimes. In the same tests I was switching between the f2 addon & your addon & found whilst yours was faster with more control in some cases, in other cases f2 addon correctly created faces where your addon did not. this is why i say to merge in with f2 addon or better as it's less code, merge f2 addon into yours or use some of it's functions so we can have your fast face creation & options with the same results as the current f2 addon. I see this as a good way to get this addon into blender 2.79 but we have very little time to do this. If your addon does what the current f2 addon does & more, we can use your addon as an update & replacement for the f2 addon. Your addon is really nice & we would like to see you develop it in Blender. I hope you understand I'm only trying here for a positive outcome. Please when you upload the new version, can use some pep8 style checker like flake8? 4 spaces indentation, 2 lines skipped between different functions/classes blocks, spaces around operators, no spaces between equals in parameters assignment, lines must be max 120 chars long. have you tested this in 2.79 and nightly builds? Just found this amazing tool while searching for F2 alternatives. But it lacked a port to 2.80, so i did it. I tried to test every feature, but maybe i missed something. Made some changes to F2 code so it's the same as official. Moved the addon panel to the right menu with it's own tab. Minor corrections on descriptions and comments.